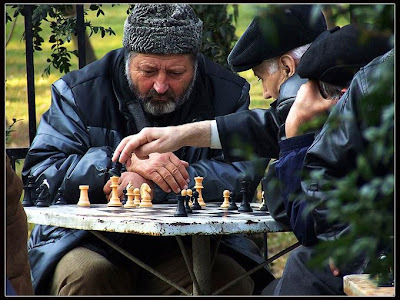 Streatham & Brixton Chess Club's blog was started in November 2006. Posts back-dated to the October archive are house-keeping posts only. For instance, there is an index of the puzzles. Also, I will save stuff here for future use on the blog, so as not to forget them. And experiment with things to see how they look, before dating them correctly. There might the odd draft too. Anyhow - you should basically ignore the October posts, unless you have come here for a particular reason. You can see the 7 most recent posts on the blog by clicking here. Or click on one of the archive links to your left, to see a whole month's worth of posts. Uploaded for future use, as other wise I would forget about it. It's very nice. If that doesn't satisfy you, the followings posts also contain positions to chew over, but they are not really purely about the puzzle. Still not had enough? Really?? In that case, try out chess blogger Steve Goldberg's Puzzles as well! Or - if studies are more your thing, Chessvibes give you a week to solve theirs. This is a test to see how a playable game interface looks. Those interested in writing for the blog should email us. PS. This used to be the text for those wishing to write on the blog, before March 17th 2009, and it still contains some useful information. If you are a member of Streatham & Brixton Chess Club, and would like to post articles on our blog - great. Just email me, and I'll invite you to post. All the stuff you need to know will take around 20 minutes to learn, maybe a bit more. There are a few other things anyone would need to know though, so I'll list those points here. - For the diagrams, I use a programme called 'DiagTransfer'. You can download it via the sidebar, under 'Chess Downloads'. When posting diagrams, post them 'large' size - ironically, this makes the file-size smallest. 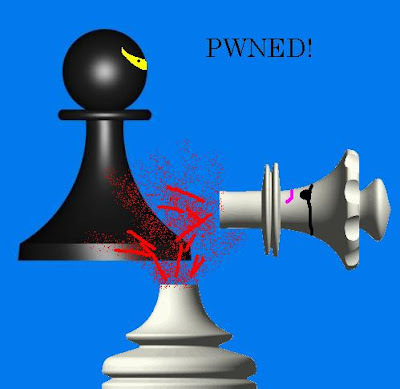 - For playable games, you can also try this: http://chess.maribelajar.com/chesspublisher/index.php . However, it is unreliable, so be careful we have moved to using this: http://www.chesspublisher.com/ (version 2). - The blog's primary focus is Streatham & Brixton Chess Club. - The blog's primary readers are Streatham & Brixton Chess Club. - But, it's not as if there is chess club news every day - plus, it's nice to be generally interesting too. And we have many readers from outside the chess club. - We aim to have a post on this blog once a day, and once only. We should not have any more than occassionally two per day or exceptionally three per day in total, between us all, ever. If we did more than that, it will be too much for people to read and keep up with, and people will lose track of what's happening. - Avoid anything offensive or potentially offensive. If you're unsure where the boundaries lie, email a few of us others from the club for an opinion. - But as Justin puts it: "this does not mean that opinions cannot be expressed, but this is neither a forum for pursuing grudges nor for the expression of political opinion. Please [in particular] do not embroil the club in rows about the conduct of opposing teams - problems in this area can be pursued through other channels." - Use the October archives as a 'sandbox', for this reason. - I am the editor and have overall control! A post to keep track of all the blog entries in this series. if you want to go through the series in order they were written start here. This might be a good idea if you've no clue what an Ultimate Blunder Rating is. Fans of the successful Superman spin-off TV series Smallville will wonder why their favourite show is being blogged about on a chess site. 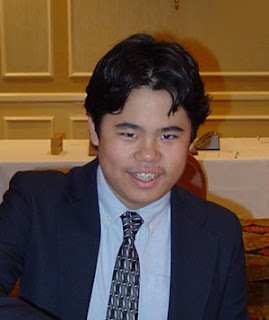 Chess fans, meanwhile, think of Smallville as the on-line user-name, nickname and playing handle of Hikaru Nakamura: a 19 year old American chess prodigy, Grand Master, and already one of the world's top 100 players. Whilst it's not uncommon for chess players to like science fiction - there is typically a Star Trek t-shirt or ten seen at any old chess tournament - liking science fiction with good looking heroes (as opposed to emotionally stunted nerds) is somewhat rarer. But perhaps Smallville's attraction to Smallville is not to hard to explain - in terms of the way he plays chess. Uh?!? I hear chess players and TV fans alike respond. Well, Smallville's style is famous for three reasons - and each seems to correspond to a certain character from Smallville . . .
Firstly, Smallville thrives on complexity, difficulty, a refusal to make life simple. He rarely resigns until it's completely over, and is always on the look out for resources to trap his opponent with. In other words, the obsessive, secretive, hording strategist who never gives up: his play throws a dark, Lex Luthor-shaped shadow over the board at all times. Secondly, and in complete contrast to his Lex-esque murky, messy chess, Smallville definitely has a Lois Lane side. He displays that in the opening stages of the game - where typically he rushes headlong up the board with the most stupid and obvious attempts to win, that even beginner-level players could repel. Naive, bolshy, fun, confident, blind and oblivious to danger - like Lois sticking her foot in it. Of course, Lois then needs to be rescued . . .
. . . and this is where Smallville's third distinctive ability comes in. Because, at times, make no mistake about it. Smallville is Clark Kent. He penetrates the problems on the board with x-ray vision, then executes apparently-impossible winning manouvers at lightening speed, that seem to come right out of nowhere. This is what clarifies the dark complexities of the Lex-like strategy; the sun after the storm. This, too, is what resuces him from the difficulties caused by his Lois-like idiot adventures. 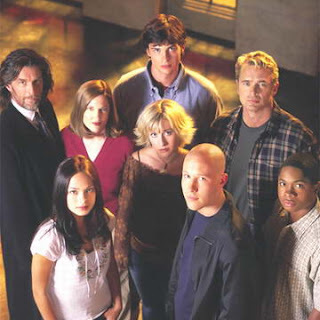 Well, hopefully now fans of Smallville know a bit more Smallville, and vice versa. But why I am telling you this? Well, earlier this year I got to play Smallville in an Internet Chess Club Simultaneous Game. I hear that Uh?!? againt from TV-viewers. 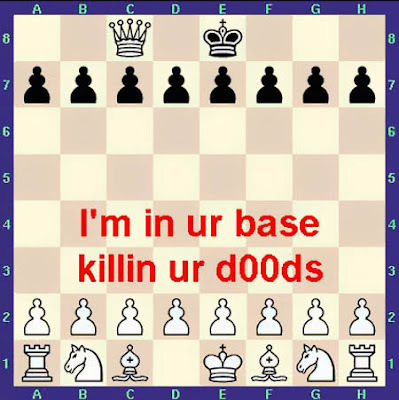 Well, the Internet Chess Club (ICC) club is a way to play games on-line through a computer programme. Many of the world's top players do this, as well as hundreds of thousands of amateurs like myself. Now, one way for the pro's to make money on the ICC is to play Simultaneous Games. A Simultaneous Game is where one strong player takes on a number of weaker players at the same time. Each weaker player only has their board to worry about - whilst the stronger player must make a move in turn on each of them, during a set time-limit. And I got to play Smallville in one of these Simultaneous Games - where he had 59 other opponents beside me. Would I manage to Kryptonite his Clark side? Or would his Lois side make an idiot out of me on move 1? And what traps would his Lex-side cunningly lay for me? Well, here's what happened . . . I have the black pieces. Nothing scary so far, or so I thought. Lois-mode is evidently switched to off, I told myself; this is all rather dull and worthy of him, in fact - just like Clark's parents. But, uh oh. What's this. Out of nowhere he suddenly has a nasty threat; e4-e5-e6, like journalist Lois asking a question you can't think how to answer. But answer I did. e5-e6 is now impossible, and white's space advantage less important because the queens have come off. If I knew more about the show, I'd make a metaphorical references to it here. 39. Ne1 is a definite Lex move - a draw by repetition and thus peace was available by 39. Rc1 instead, but he pushes his position to breaking point for the win. 39. ... Kc6 40. h4 d4 41. cxd4+ Kd5 42. Nf3. Now at this point, it's clear the Lex-like uncompromising aggression has lead him into difficulties, since 42. ... Ra4 would probably win for black. But with a Lois-like innocent sweetness, Smallville proposed a draw. And since it was 3am and I was blind-drunk (probably the best way to watch the TV series too) I agreed. Game Drawn. Superman just didn't show up, and so the point was split between Smallville and me, his opponent, Jurchessic Park. It might be nice to do a 'quote for the week' slot - quotes that are about or relevant to chess, or otherwise of definite interest to our club. So, I will accrue quotes in this post, with that in mind for the future. Please feel free to suggest your own. The format I would have in mind would be two lines of brief pre-amble; quote; paragraph (plus position if required) of chat. 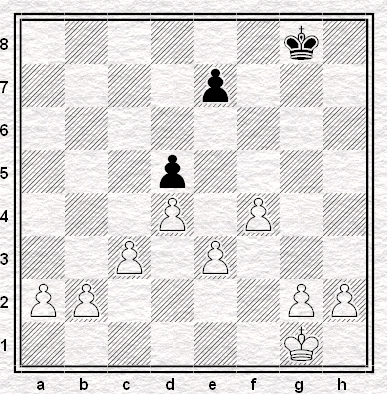 (1) The following position is a typical pawn structure arising from the Queen's Gambit Declined. Assume there are several pieces left on the board - enough to do something with - but that none of them are in particularly aggressive positions. What would your plan be as white, focusing on pawn moves? 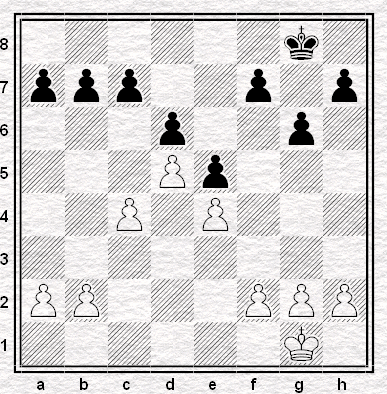 Clue for the above: the plan is called a 'minority attack' and involves creating a weakness in the black queenside. 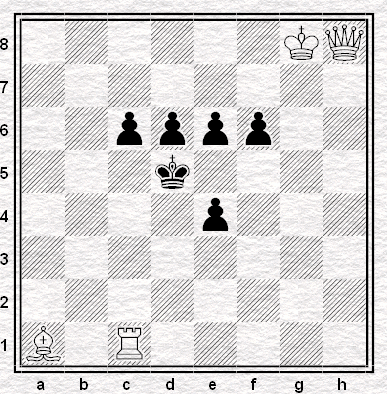 (2) The following position features a typical pawn structure that might arise from the King's Indian Attack. Assume both sides have all or nearly all their pieces left on the board, but again in relatively normal positions. (Eg, no knight on d4 for black& nothing on e6 for white, etc.) What plan with the pawns do you think white should pursue? What plan do you think black should pursue? (3) White's pawn structure in the following position is typical of the Stonewall Attack - so called because his position is very hard to breach. Assume that both players have ALL their pieces left on the board. Assume that black has ALL his pawns on the board too - not just the two pictured. 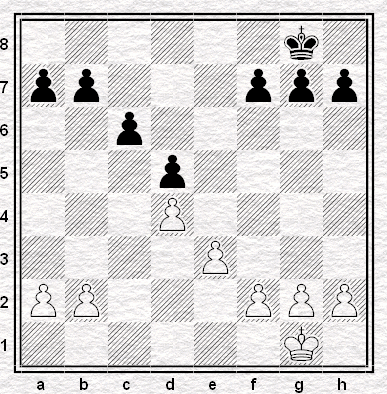 (3b) Where would you like to place the black pawns and pieces to best defend his king against the attack in 3a? This post includes all photos I have of the London-Moscow Ice Chess Match, which took place on 11th January 2007. If you click them, you will get the full-size version. The photos were sent to me by R J Christie. Full report here. NB, they are predated in the October 2006 archive because this archive is especially for house-keeping posts, and those that aren't to be bumped to the top of the front-page. A Sequence on chess in Bedlam and Broadmoor Asylums, starting out with Richard Dadd's chess painting The Child's Problem. Dadd. Oxford. Saunderson. Who's next? Select from the Menu below. Please see the separate index to 13 posts relating to chessers in Bethlem/Broadmoor Asylum from Victorian times onwards - especially Richard Dadd. Revelations by Richard Tillett about a short lived chess club in Oxford - one of the first. 11. War Game 7 etc. A series, by Martin Smith, mining the archive of the two volumes of the Surrey County Chess Association Match Books 1884 to 1967. Please see the separate index to 23 posts on the ground-breaking trail beaten (by Richard Tillett and Martin Smith) investigating Thomas Leeming's painting of the Gentlemen of the Hereford Chess Club of 1815. A series revealing all about the three issues of Knightmare! S&BCC's shortlived chess mag in 1977-9. A detailed exploration by Martin Smith of Anthony Rosenbaum's painting of 47 Victorian chess players unveiled in 1880. 1. Waltzing Matilda, and the further six episodes on the chess, life and politics of Louisa Matilda Fagan, the strongest female player in late Victorian England. Chess in and around Streatham (and beyond) in days of yore (in the company of MS). Please see the separate index to a series of posts, by Jonathan B, about international chess in the 1970s. This index lists game notes by Ray Keene that have been found to be reproduced in different places, substantially or entirely, without acknowledgement. As with the Ray Keene Plagiarism Index it lists only those examples which have been documented online, which is only a very small proportion of those uncovered*. UPDATE: I largely suspended work on this index after discovering more than eighty examples in The Times Little Book Of Chess Secrets (Harper Collins, 2013) alone, on the grounds that the work of documentation was too extensive to be a practical proposition. More than four hundred examples of recycling have so far been detected. Adams-Carlsen, Olympiad 2010. Times 29 September 2010, 12 April 2011, 30 July 2011, 2 December 2011 and 13 March 2012. Spectator 9 October 2010. Anand-Kasparov, New York 1995 (13). Spectator 22 September 2001, 13 December 1997, and 7 October 1995. World Chess Champonship: Kasparov v Anand (Batsford 1995). Benko-Petrosian, Los Angeles 1963. Times 28 August 2013. Petrosian vs the Elite (Batsford 2006). Carlsen-Nakamura, Medias 2011. Spectator 25 June 2011. Times January 11 2012. Sunday Times 17 March 2013. Corden-Williams, Varsity Match 1970. Spectator 8 May 2004. Times 5 March 2011 and 4 March 2000. Gelfand-Beliavsky, Linares 1990. Spectator 10 March 1990 and 22 December 1990. Hartston-Bellon. Spectator 31 October 1988. Times 23 July 2013. Howell-Gordon, Torquay 2009. Times 1 August 2013 and 29 September 2011. Spectator 15 August 2009 and 22 August 2009. Howell-Pert, Sheffield 2011. Times 2 August 2013 and 5 August 2011. Ivanchuk-Kramnik, Las Palmas 1996. Spectator 4 January 1997 and 20 July 2013. Ivanchuk-Shirov, Wijk aan Zee 1996. Spectator 20 March 1996 and 29 September 2000. Times 18 December 1999, 27 January 2012 and 20 July 2013. Jones-Rendle, Sheffield 2011. Times 31 July 2013 and 4 August 2011. Jones-Short, Bunratty 2011. Times 18 April 2011, 5 July 2012 and 30 July 2013. Jones-Turner, North Shields 2012. Times 29 July 2013 and 15 August 2012. Karpov-Miles, Bath 1983. Spectator, 21 June 2003 and 10 August 2013. Times 15 November 2011. Spectator Book Of Chess (Hardinge Simpole 2004). Tony Miles: England's Chess Gladiator (Hardinge Simpole 2006). Kasparov-Ivanchuk, Horgen 1995. Spectator 11 November 1995. Sunday Times 21 July 2013. Kasparov-Karpov, match, Moscow 1984/5, games 9, 13, 16 and 32. Spectator, 13 October 1984, 27 October 1984, 3 November 1984, 22 December 1984. The Moscow Challenge (Batsford, 1985). Keres-Petrosian, Candidates 1959. Sunday Times 25 August 2013. Petrosian vs the Elite (Batsford 2006). Learn from the Grandmasters (Batsford 1975). Kramnik-Leko, match, Dortmund 2004 (8). Spectator 16 October 2004. Times 2 December 2010, 24 August 2012 and 23 April 2013. Kramnik-Leko, match, Dortmund 2004 (14). Spectator 23 October 2004. Times 20 August 2010. Kramnik-Leko, Mexico 2007. Times 22 October 2010 and 21 September 2011. Spectator 13 October 2007. Nakamura-Adams, London 2011. 21 December 2011 and 11 December 2014. Sunday Times 25 November 2012. Nakamura-Gelfand, London 2013. Times 23 December 2013 and 9 December 2014. Olafsson-Wade, Reykjavik 1964. Spectator 6 December 2008 and 10 May 2003. Times 22 July 2013. Panno-Petrosian, Candidates 1956 (fragment). Spectator 8 June 2002. Petrosian vs the Elite (Batsford 2006). Parker-Rowson, Swansea 2006. Times 20 July 2012 and 26 July 2010. Penrose-Goldenberg, world correspondence championship 1989-91. Times 24 July 2013 and 19 October 1996. Penrose-Keene, Blackpool 1971. Times 26 July 2013, 23 July 2011, 17 April 2012 and 24 July 2012. Becoming A Grandmaster (Batsford 1977). British Chess Magazine October 1971. Petrosian-Benko, Los Angeles 1963. Times 29 August 2013. Petrosian vs the Elite (Batsford 2006). Petrosian-Bronstein, Candidates 1956 (fragment). Spectator 8 June 2002. Petrosian vs the Elite (Batsford 2006). Petrosian-Botvinnik, Moscow 1963. Times 24 August 2013. Petrosian vs the Elite (Batsford 2006). Petrosian-Gligoric, Los Angeles, 1963. Times 27 August 2013. Petrosian vs the Elite (Batsford 2006). Petrosian-Keres, Candidates 1956 (fragment). Spectator 8 June 2002. Petrosian vs the Elite (Batsford 2006). Petrosian-Psakhis, Las Palmas 1982. Times 30 August 2013. Petrosian vs the Elite (Batsford 2006). Petrosian-Spassky, Candidates 1956 (fragment). Spectator 8 June 2002. Petrosian vs the Elite (Batsford 2006). Petrosian-Tal, Moscow 1963. Times 29 August 2013. Petrosian vs the Elite (Batsford 2006). Short-Kramnik, London 2010. Times 15 December 2010, 29 November 2011, 16 March 2013 and 12 December 2014. Smyslov-Petrosian, Candidates 1956 (fragment). Spectator 8 June 2002. Petrosian vs the Elite (Batsford 2006). Topalov-Kramnik, match, Elista 2006 (2). Times 6 December 2010 and 13 June 2013. "Ray Keene may or may not have purloined the odd bit of analysis of the Lisitsin Gambit." Research has established that a large number of Ray Keene's Times and Spectator columns have been plagiarised from elsewhere. A precise total is difficult to give (not least because they are often duplicated) but so far it is more than one hundred and forty, with more than one hundred and thirty from the beginning of 2011 onwards. We expect there are more to be discovered. We link below only to those of Ray's plagiarisms which have so far been documented online, which is presently just a small proportion of those so far identified. The list is added to regularly. If you're new to the subject, this post may be a good place to start. Please also see the Plagiarised by Ray Keene index, which takes the information in the pieces linked to below and catalogues the persons and publications Ray has plagiarised. Ray plagiarises Kasparov's My Great Predecessors in the Spectator, March 12 2011. Ray plagiarises Kasparov's My Great Predecessors in the Times, 5 June 2013 and 28 May 2010. Ray plagiarises Kasparov's My Great Predecessors in the Times, 15 April 2013 and the Spectator, 19 May 2012. Ray plagiarises Kasparov's My Great Predecessors in the Times, 22 February 2011 and 2 May 2011. Ray plagiarises Kasparov's My Great Predecessors (and Bobby Fischer) in the Times, 8 July 2011 and 4 April 2012. Ray plagiarises Kasparov's Revolution In The 70s in the Times, 19 April 2012. Ray plagiarises Kasparov's My Great Predecessors in the Times, 17 September 2011. Ray plagiarises Kasparov's My Great Predecessors in the Spectator, 13 November 2010 and 17 March 2012. Ray plagiarises Anand's My Best Games of Chess in the Times, 6 October 2011. Ray plagiarises Kasparov's My Great Predecessors in the Spectator, 1 September 2012. Ray plagiarises Kasparov's My Great Predecessors in the Times, 13 August 2011 and 29 May 2013. Ray plagiarises Kasparov's My Great Predecessors in the Spectator, 15/22 December 2012. Ray plagiarises Garry Kasparov On Modern Chess in the Spectator, 5 January 2013 and the Times, 8 December 2011. Ray plagiarises Alexander Münninghoff's Max Euwe - The Biography in the Times, 7 March 2012. Ray plagiarises Tony Miles in the Spectator, 21 June 2003 and 10 August 2013, in The Spectator Book Of Chess (Hardinge Simpole 2004), Tony Miles: England's Chess Gladiator (Hardinge Simpole 2006) and the Times 15 November 2011. Ray plagiarises Kasparov's My Great Predecessors in the Times, 10 June 2013. Ray plagiarises Garry Kasparov On Modern Chess in the Times, 11 June 2013. Ray plagiarises Paul Lamford's Spectator notes in his book The Moscow Challenge (Batsford, 1985). Ray plagiarises Garry Kasparov On Modern Chess in the Times, 12 June 2013. Ray plagiarises Kasparov's My Great Predecessors in the Times, 8 June 2013. Ray plagiarises Kasparov's My Great Predecessors in the Times, 7 June 2013. Ray plagiarises Kasparov's My Great Predecessors in the Times, 6 June 2013. Ray plagiarises Kasparov's My Great Predecessors in the Times, 4 June 2013. Ray plagiarises Viktor Korchnoi (from Learn from the Grandmasters) in the Times, 3 June 2013. Ray plagiarises Kasparov's My Great Predecessors in the Times, 1 June 2013. Ray plagiarises Bill Hartston (from Learn from the Grandmasters) in the Spectator, 14 April 2012. Ray plagiarises Kasparov's My Great Predecessors in the Times, 3 January 2012 and 24 December 2012. Ray plagiarises a translation by George Botterill and Birgitte Vibeke Egan Transø (provided for Reappraisal) in the Spectator, 24 October 1998. Ray plagiarises a note by Max Euwe in the Times, 28 February 2015. Ray plagiarises Kasparov's My Great Predecessors in the Times, 20 April 2013. Ray plagiarises Kasparov's My Great Predecessors (and Hans Kmoch) in the Times, 27 August 2011. Ray plagiarises Kasparov's My Great Predecessors in the Times, 24 October 2016. Ray plagiarises CHESS in Chessville. Ray plagiarises the late Ian Wells in CHESS. Ray plagiarises Jeremy Spinrad and the Oxford Companion to Chess in the Spectator. Ray plagiarises Kasparov's My Great Predecessors on Chessgames.com.